My youngest daughter’s birthday was yesterday. Her chosen menu for her kids party: lemon pound cake, rice crispy treats, and glazed donut holes. After a week’s vacation of doing nothing, not even preparing one meal for ourselves, I had to hit the ground running last weekend to pull it together for this party. Yes, I had to cook. Coming home from vacation also meant facing some issues that we gladly left behind for a week – an unwelcome health diagnosis, complicated conflict with business partners, and uncompleted projects at our still-in-transition home. When I dug out my favorite recipe for lemon pound cake I was once again reminded what a comfort cooking can be, and all work really. A cooking project typically has a beginning, middle, and end. You are usually given instructions on how to do it. You often get to eat your efforts and even if it isn’t perfect, it is yours. If it fails you clean it up and move on. There is a straightforwardness about the process that is often elusive to us in the complexities of every day life. Back working at Esquina has given me a new appreciation of the benefit of work, and especially of serving others. I don’t know what to say when my loved on is facing an uncertain medical road, but boy can I refill water – I can do it all day long and feel good that I am indeed meeting someone’s need out there. love and being able to do for them and those you love. I understand your post very well. I have found that during the hardest most challenging moments of my personal life. Work has been my savior. It allows me to step out of the fog and contribute to the greater good. 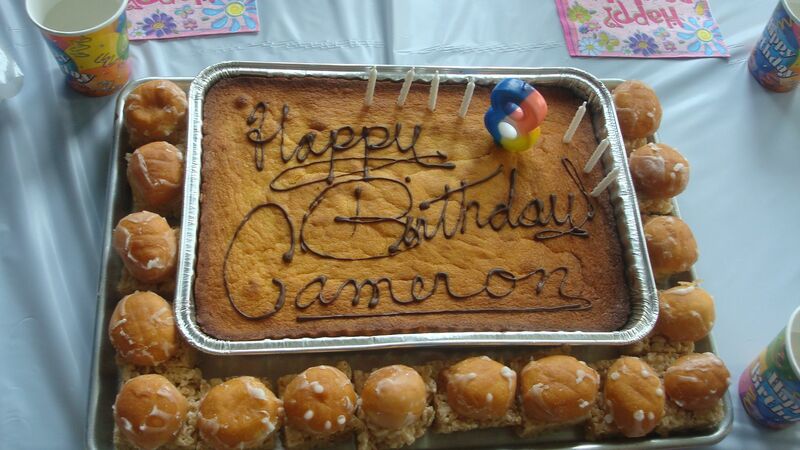 What a joy to see the photo of Cameron’s cake and be reminded of how much fun we had meeting your family on vacation a couple weeks ago. I hope her day was joy-filled. Joey & David send a big hello to Emma and Cameron. I’m sorry to hear of Robert’s health issues and other challenges you mentioned in your post… Theresa and I will be praying.